We’re well over halfway through our WInter-Spring Pub Champions Trivia League season! If you haven’t seen your team’s latest scores, you can check out your venue’s location page. You will find your latest scores, as well as the cumulative total of your 12 best scores so far! As we prepare for the warmth and rain of spring, it’s time to roll out next month’s lineup of fan-friendly theme nights! Once again, we’ve brought some powerhouse theme nights, as well as a special Saturday show for fans of Game of Thrones! Gilmore Girls – April 7th. 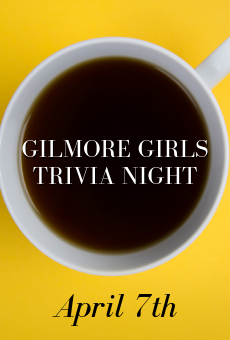 All fast-talkers, coffee drinkers, Chilton grads, and DAR members, follow Sporcle Live as we lead you to Stars Hollow for Gilmore Girls trivia! For ticket and location information, check out our Gilmore Girls tickets page. 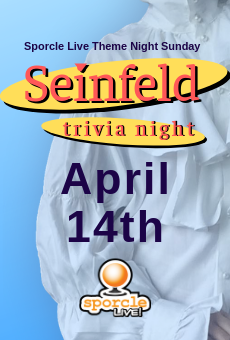 Seinfeld – April 14th. Did you know that the original title for War and Peace was War, What Is It Good For? If you did, you’d be an ace at Seinfeld trivia. For ticket and location information, check out our Seinfeld tickets page. Game of Thrones – Saturday, April 20th. Do you drink and know things? Choose your alliances wisely, because winter is coming to Sporcle Live. 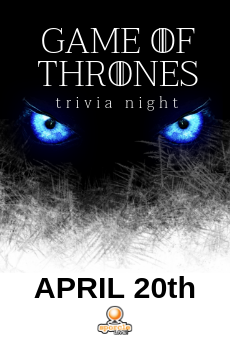 Game of Thrones trivia is sure to be a better time than Robb’s wedding! For ticket and location information, check out The Game of Thrones tickets page. The Good Place – April 28th. Jearimy Bearimy, baby: You and Sporcle Live can chill in the dot of the “i” forever if you win The Good Place trivia, so gather your chili babies and your dance crew for a night of fun, philosophy, and shrimp! 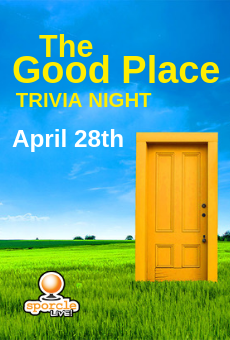 For ticket and location information, check out The Good Place tickets page. Characters By Picture – Season 3 Character Chain – Who Said it? Tickets are $25 per team (max of 5 players), with a $100 cash prize, and seating is limited, so it is best to purchase your tickets ASAP! You must purchase your tickets online in advance, there are no tickets for sale at the venue. Locations are being added regularly, check back often if you don’t see a show near you! All of our theme nights can be found at sporclelive.com/themenights. Sporcle Live players make the BEST hosts! Got what it takes? Apply today! We are hiring in many areas but have an immediate need in Maumee, OH, Toledo, OH, Napoleon, OH, Bronx, NY, Akron, OH, Mentor, OH, Holland, OH, Redmond, WA, Keller, TX, Frisco, TX, Copley, OH, Elyria, OH, Lorain, OH, Traverse City, MI, Perrysburg, OH, Cleveland, OH, New Buffalo, MI, Fremont, MI, Sylvania, OH, Toledo, OH. Apply now!